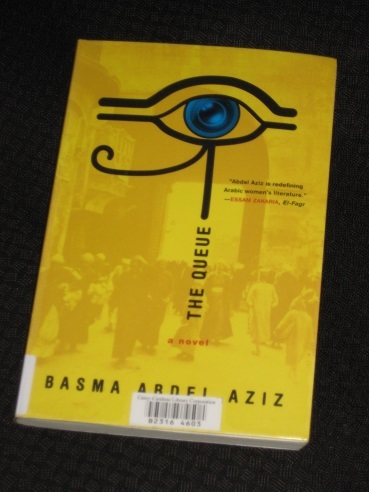 Basma Abdel Aziz’s The Queue (translated by Elisabeth Jaquette, published by Melville House Publishing) takes us to an unnamed (but rather familiar) land where, after a failed coup, power has become focused around a shadowy entity dubbed the Gate. People requiring any kind of document (such as the ominous-sounding Certificate of True Citizenship) must present themselves at the Main Gate of the Northern Building, where they must wait until their case can be processed. However, after another attempted uprising, euphemistically called the ‘Disgraceful Events’, the authorities have temporarily closed the Gate, and the queue outside the building has begun to grow to immense proportions. It’s here that the real story begins, as thirty-eight year-old Yehya Gad el-Rab Saeed joins the queue. The unfortunate Yehya was caught unawares by the recent conflict, hit by a stray bullet on leaving his office, and his reason for joining the group of people waiting for the Gate to reopen is to obtain permission for surgery to remove the bullet lodged near his groin. However, this could may prove to be a futile task. According to the newspapers, no shots were fired during the Disgraceful Events, so how can anyone have a bullet wound? Sadly, there’s no shortage of dystopian narratives in contemporary society, and The Queue is painfully placed in the ‘not real, but could be’ category. It’s a novel which pushes authoritarian and religious dominance in the Middle East to extremes, showing how governments can slowly extend their power, and the methods they use to do so. There’s more than a hint of Big Brother here, and the Orwellian features include a newspaper that rewrites history to keep the masses fooled. Its name? The Truth, of course. A novel set in a queue that isn’t moving may sound restrictive, but it actually works very well. We move outwards from the stoic Yehya to encounter a whole cast of characters, both from his inner circle of acquaintances and the people he meets in the queue. As well as his partner Amani and his best friend Nagy, there’s the helpful reporter Ehab, the motherly entrepreneur Um Mabrouk and Ines, a young school teacher who has fallen foul of the Gate’s decrees. However, one of the novel’s major characters is to be found away from the queue: Tarek, the doctor who was too scared to operate on Yehya after seeing an edict forbidding anyone from removing bullets without the permission of the Gate. One of the more interesting strands of the novel examines the poor doctor’s ethical torment as he balances his desire for a quiet life with the knowledge that Yehya will die without surgery. Unable to sleep, even with the help of pills, he continually returns to Yehya’s file, poring over the edited version of the account he initially wrote. It’s only later that he realises that the file, which is kept under lock and key, is being regularly updated. They had dispatched droves of delegates to knock on people’s doors during dawn prayer time, to ask their opinion of recent events and how the country was being run. The results had finally been released, and were precisely the same as the results of the previous poll. Citizens had unanimously endorsed its governance, laws and court rulings – wholeheartedly and dutifully supporting the just decrees that had recently been issued. Those conducting the poll had therefore decided not to conduct one again. To simplify matters, they would announce the previous poll’s results on a set yearly date. Yet it soon recovers, and it isn’t long before the microbus drivers, coffee shop owners and, of course, the ever resourceful Um Mabrouk adapt to life in the open air. Life simply goes on, even if the queue’s not moving, and people soon become so used to this existence that they even get upset when protesters want to disrupt it. As you can see, there’s lot to like about The Queue, an excellently written work (credit must also go here to Jaquette for her work in making this a smooth and entertaining read) with an intriguing story. While there’s an obvious political edge to the story, it’s also a page-turner, with the reader wanting to know more about the world Abdel Aziz has created. However, this leads to what is perhaps the only minor flaw in the novel. Having built up our expectations, the writer really needed to provide a good ending, and I’m not convinced that she’s really nailed the dismount here. The last ten pages or so seemed rushed, and even if the last scene feels right, there’s a sense that the final part doesn’t really provide the resolution the novel deserves. A serendipitous choice, excellent. This melange of combining real and not real seems to be becoming more prominent recently. I’m not sure I like the feeling of not knowing while reading which universe we are in. I enjoyed this one a lot Tony – the dystopian elements added a lot to the story and I thought it was so cleverly done. And I certainly don’t think I’d read any Egyptian women’s fiction before so it was a good first for me. I enjoyed this book, too – would quite like to have seen it on the MBIP longlist, actually. I agree with you on the ending, though – disappointing after such a good beginning and middle. David – Glad to see I’m not alone in thinking this; the end was a bit of a let down, but that doesn’t change the fact that it was a very good book and could well have taken one of the MBIP longlist spots (I can even think of one shortlisted title it could have replaced…).